My name is Michael Ricardo Pierre Wong Loi Sing I was born in Paramaribo, Suriname south America; I live in France now, in the south of France. 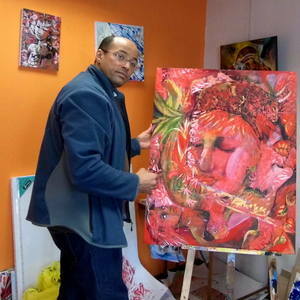 I started as an autodidact, and after having exhibited in the Stedelijk Museum in Amsterdam Holland in 1995, in a group exhibition 20 years of art from Suriname, by curator Rudi Fuchs, I went back to Holland to get my masters degree in Art. I paint dream like paintings which are often visible from four sides. Sometimes two paintings which are a dip tic become a multiple dip tic because more sides correspond with more sides. I paint nature, women, people, stories, fantasy, and i try to create a new way of presenting an iconography or symbolism in my art. one that is new and refers to my origins. South America has a very old iconography, although it has been forgotten or because it originates from an oral tradition, it stays abstract. Suriname as a country exists only for about 500 years, its art as a comparative image to Europe's art is very young. It's petroglyphs are ancients of course, also its amerindian culture and images. I am a mixture of many cultures , Caribbean indian, African, Caucasian, Jewish, Indian, Portugese, and Chinese. the origins of my art stem from the continents that drift within my soul. 2010 exposé on the art philosophy of the way we create art, the creators nest. I am training 24 women how to paint on fabric and will have a fashion show on the 24 Th. of january 2015. Opening of my art studio in Ales France on the 1 st of December 2014. 2015 12-15 march ; Exhibition at St Ambroix France, hosted by the Lions Club Femina, an organisation that does a lot for the less fortunate. I will be in the United states, California, until the half of april 2017 for several shows. http://www.lukuno.org as we are doing a crowdfunding as well.